General Motors held a press conference today to update the media on its partnership with LG and their supply relationship for the upcoming Chevy Bolt. 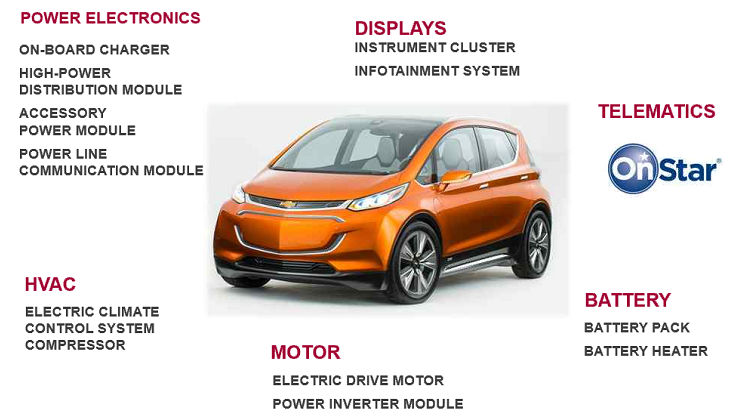 GM confirmed that the Korea-based electronic giant will make most of the components that make the Bolt an electric vehicle including the battery pack, the electric motor and the power electronics. Automakers have been outsourcing the manufacturing of a large part of their vehicles for quite sometime now, while mostly retaining the assembly process and engine design. With the transition to electric powertrains, some thought it could be an opportunity to innovate the supply chain and manufacturing process, but GM seems to be doubling down on outsourcing for its first major entry in the all-electric vehicle market. LG was already making the battery packs for the Chevy Volt and not long after they announced the Bolt earlier this year, the company confirmed that it will have a similar agreement with GM for the new electric car. All main components of the drivetrain as well as the displays and infotainment system of the vehicle will be made by the Korean electronics giant. During the press conference, GM reiterated an expected start of production in late 2016, which will take place at GM’s Orion Township, Michigan assembly plant. The Bolt is expected to have a starting price of around $37,500 before any EV incentives and a range of over 200 miles on a single charge. 2015 Chevrolet Bolt EV Concept all electric vehicle. Overhead view of concept with glass roof. Bolt EV Concept features an unexpectedly large interior from a subcompact crossover EV. Chevy’s experience gained from both the Volt and Spark EV to make an affordable, long-range all-electric vehicle to market. The Bolt EV is designed to meet the daily driving needs of Chevrolet customers around the globe with more than 200 miles of range and a price tag around $30,000. 2015 Chevrolet Bolt EV Concept all electric vehicle. Bolt EV Concept builds upon Chevy’s experience gained from both the Volt and Spark EV to make an affordable, long-range all-electric vehicle to market. The Bolt EV is designed to meet the daily driving needs of Chevrolet customers around the globe with more than 200 miles of range and a price tag around $30,000. 2015 Chevrolet Bolt EV Concept Interior features unique crossover proportions. A flat, flow-through floor adds to the roominess of the cabin. Slim-architecture seats mounted on exposed aluminum pedestals create a floating effect. The minimalist center console “floats” – suspended from the front seats. Leather wrapped electronic shifter with anodized orange accents adds to the hi-tech feel of interior.